Financial advisors who are interested in business networking or finding prospects online should focus their social media efforts on LinkedIn. The site was created specifically for business purposes: corporate recruiting, professional networking, and, more recently, news. LinkedIn tends to attract a slightly older, more professionally oriented demographic than Facebook and Twitter—making it particularly appropriate for the financial advisor community. To make your use of LinkedIn as effective as possible, we suggest aspiring to join the 500+ Club. To expand your LinkedIn network, and keep your name top of mind with all your existing connections, make your first goal to get 500 connections within six months. Once you reach 500+ connections (and LinkedIn will always display 500+, regardless of whether you have 500 or 5,000 connections), you gain a certain status among LinkedIn users—you're perceived as an expert in your field. So how do you get 500+ connections? Calculate how many more connections you need and divide that figure by the number of weeks you've given yourself to reach the 500 mark (e.g., 24 to get there from 0 in six months). Send connection requests to that many people once a week. Pick a day and time and block it on your calendar. For example, start with putting in 15 minutes every Tuesday at 8:30 A.M. while you're having your morning coffee. Whom should you connect with? Send connection requests to all of your clients and strategic alliances. If you have a licensed assistant, he or she could do this for you. Take the stack of business cards you've collected over the years and search for those people on LinkedIn to connect with. Again, this is something your assistant could help you with. 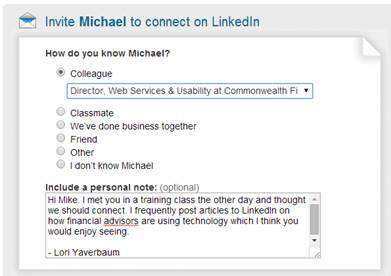 Next, utilize the tools within LinkedIn for suggestions. 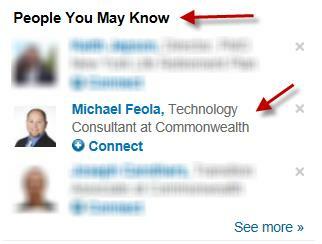 Look at the People You May Know section on the right side of your LinkedIn profile. You can send a connection request directly from this box or click on the See more link in the bottom right corner to view and connect with more people. Take a minute to add a message all to of your connection requests before sending them. This small gesture demonstrates the care, attention to detail, and personalized approach you bring to everything you do. Note that there is a character limit, so you can only send a sentence or two. To add a custom message, go to the person's profile page and click Connect. You will then see the pop-up below, which will allow you to add a personal message. Monitor the Who's Viewed Your Profile section on the right side of your LinkedIn profile. If someone is looking at your profile, they already have some interest in finding out more about you. Why not proactively reach out to them with a personalized message? Another way to seek out potential connections is to subscribe to e-mail updates via the Communications tab in LinkedIn's Privacy & Settings section, located in the menu that appears when you click on your picture in the top right corner of the screen. By doing this, you'll be able to see who your connections are connecting with and which of those people might fall into your target market. Each week or month, set a goal to ask one of your connections to facilitate an online introduction to one of those promising connections. Keep track of who you meet. For instance, if you attend a fundraising event and meet someone who could be a potential client or business partner, look them up on LinkedIn the next day and send a personalized connection request. Try to make a habit of doing this any time you meet someone new. Who knows? Your next big client could be sitting next to you on a flight. Should You Import Contacts into LinkedIn? While I am a huge fan of LinkedIn and the integrity of the site, you just never know how those e-mail addresses are or might be used by the company in the future. For instance, if someone in your address book doesn't currently have a LinkedIn profile, this opens the door for LinkedIn to send him or her an e-mail saying that someone is "requesting you set up a LinkedIn profile." You may have experienced this yourself prior to setting up your own profile. This is "snapshot" activity, so you would need to repeat the upload process every few months. This is one more task that takes up your time and, again, potentially compromises the information of your personal contacts. I believe you should only be connecting with people who provide a business benefit to you—now or in the future. My guess is that you have many contacts in your e-mail system who wouldn't fit this qualification, including some competitors. Why open that door? Are you a member of LinkedIn's 500+ Club? Tell us about how this has impacted your business networking efforts.